Sideshow rende omaggio a Heath Ledger presentando questa fantastica statua Premium Format che raffigura l’attore nei panni di Joker ne “Il Cavaliere Oscuro”, suo ultimo film. Nessun dettaglio è stato tralasciato: dallo sguardo, al trucco, al costume, tutto è assolutamente perfetto. Da avere! Commemorating Heath Ledger’s critically acclaimed performance in Christopher Nolan’s remarkable film trilogy, Sideshow is proud to present the Joker Premium Format Figure from The Dark Knight. And here we go! Sideshow’s artists have created a vision of chaos and anarchy incarnate, capturing every haunting detail of Heath Ledger as Batman’s greatest enemy, from his disheveled green hair to the creased lines of his heavy makeup, and chilling scars of his Glasglow smile. A man of simple tastes, the Joker comes dressed to the nines in his ‘cheap’ purple suit, with layers of expertly tailored fabric costuming. Armed with serious firepower and demonstrating his flair for theatrics, the psychotic mastermind flaunts his calling card. 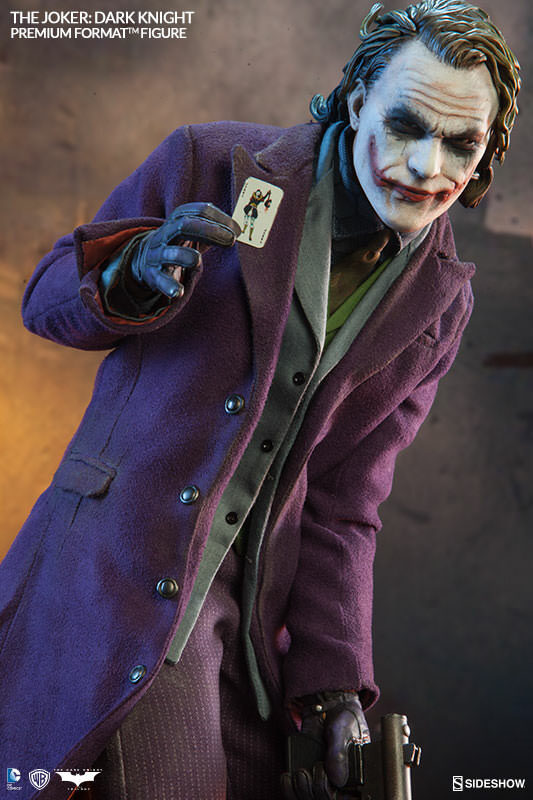 Standing 19” tall over the broken streets of Gotham, Sideshow’s Joker Premium Format Figure is a must-have for fans of The Dark Knight. Because collectors deserve a better class of criminal, and we’re going to give him to them. Remember, there is no Joker without the Batman – complete your display with Sideshow’s Batman Premium Format Figure from The Dark Knight.